From traditional to unique styles that include German themes and motifs, brewery mugs and more, our glass beer mugs and beer glasses will suit any occasion. Available in 0.5 liter or full liters, these sturdy mugs and glasses will hold plenty of beer and are commonly used in beer gardens, bars or at home. 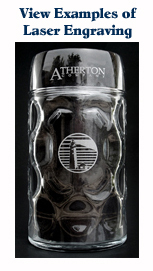 Order a personalized beer mug with custom laser engraving from German Steins today. Dad & Father’s Day, because you can show your love any time of year. Using laser technology to produce crisp, clean, and precise engraving lines, we are able to add names, initials, and even complex company logos! Take a look at some of the custom engraving our team of highly trained professionals can do. 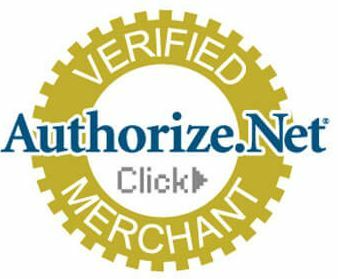 Feel free to browse through our massive selection of currently available glass beer mugs, glass beer boots, and other German gifts. Whether you are trying to find a gift for someone in the armed forces, a sports fanatic, or devout beer drinker we have got something for you. For the serious collector, we also offer beautiful, hand-painted German beer steins that are affordable to even those on a strict budget. However, we promise to never sacrifice on quality, so you can be guaranteed that your stein is the best available on the market. Our mugs can be custom engraved for any upcoming event or other special occasions. 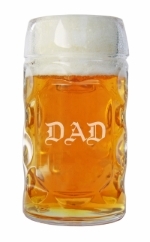 Personalized beer mugs from German Steins make great groomsmen gifts. Groomsmen often buy matching steins as a souvenir to remind them of a wedding or bachelor party. Besides—there is something just wrong about sitting at the reception table drinking out of red-solo cups. We have completed order for birthday bashes, farewell parties, and almost any other special event you can think of. Add your company logo, the person-of-honors name to each mug for a small upcharge, and we promise that you will not be disappointed in the quality of our laser engraving. Why Use a Glass Beer Mug? We are often asked what the benefits of drinking a beer out of a mug or glass are versus simply consuming our favorite beverages straight out of the bottle. For starters, we aren’t Neanderthals and are capable of drinking out of a cup. Using a glass or mug gives any beer drinker a sense of sophistication that drinking out of a bottle or can simply cannot. So, if you don’t want to look like a two year old guzzling down his favorite brand of 2% out of a sippie cup, use a glass. Also, a glass allows you to effectively see, examine, and downright show off your beer. A great beer combined with a solid pour is a beautiful thing, and, in some countries, it is actually illegal to mask it behind the curtain of a bottle. Okay, maybe we made that up. But the designs behind some of our mugs like these ceramic beer boots, the dimpled standard mugs, or even just some of the basic steins are guaranteed to keep your beer looking refreshing while you enjoy the color and aroma of all the frosty goodness you can handle. What really sets our beer mugs and steins apart is our overall commitment to making sure that we produce only the best possible products. The quality of our glass and crystal makes it strong yet extremely beautiful, so with careful handling you can be guaranteed to make it home with your mug at the end of the night. We do not cut corners, and our products are not even in the same league as cheap, dollar-store items, and this is what our customers thirst for—and beer, of course. Anyone looking for more information on our customizable beer mugs, high quality German gifts, or simply have any questions, feel free to contact a Germansteins.com associate today!